PET FRIENDLY! SKI IN SKI OUT! This slope side 2 BR, 2 Bath Flat sleeps 7 offering a comfortable living space for guests. 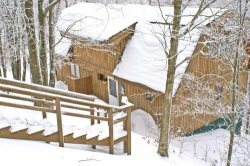 Includes wood burning fireplace(wood provided) and large deck with views of the mountains and wildlife. Equipped with 3 TV's,including a 55 in Smart TV in the living room with several sports channels and free Netflix. High speed and long distance for your convenience. Fully equipped kitchen with new tile flooring,granite counter tops,and espresso machine. Conveniently store your boots and skis in the mud room and make yourself at home !